My desk planner tells me that today is the first day of Spring, so, in honor of this day, I thought I would highlight the first homestand and some of the activities that we have planned. That and the weather should make everyone think of baseball this week. 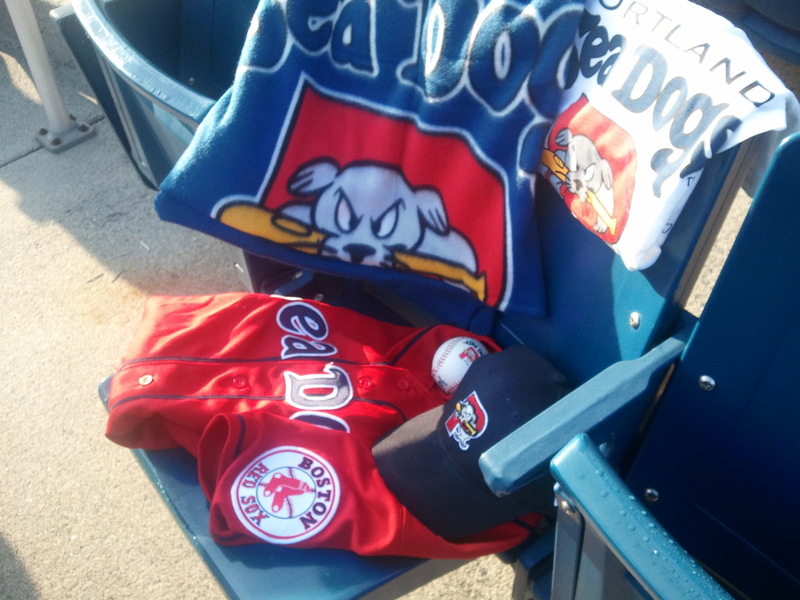 The Portland Sea Dogs open on the road in Reading, PA at 4:05pm. Get a jump start on the rest of the Sea Dogs fans and hear Mike Antonellis on WPEI 95.9 and 95.9, our new flagship station. You can also follow Mike and his travel tweets @seadogsradio. Where the team goes, Mike goes, so he is a great resource for up to date information regarding the team. Opening Day! Talk about a command performance. We have a 71 home game schedule that lasts through Labor Day, yet Opening Day is the most nerve-wracking day of all, at least for me. Our winter of hard work is put to the test and we open our doors to the public. Thanks to U.S. Cellular, we are giving away a fleece blanket to the first 1,000 fans that enter the park. In addition to the adorable giveaway, this day has special meaning because it is the start of something new, which is always exciting. We do a full introduction of both teams in the pre-game, and you get your first glimpse of the team you will root for through Labor Day and beyond. Photo Credit: ME. This morning. This is a college night at the park, and Courtney and everyone in Group Sales has been hard at work contacting local colleges, universities and specifically Sport Management programs to attend the game and see how we put on our show. Sport Management as a major in college has seen an enormous jump in popularity amongst undergrads and grads in recent years, and we are fortunate to have a strong base of schools in Maine and New England from which to draw talent. Additionally, we know that we are an excellent classroom for these future students (and let’s be serious, probably my future bosses), so it only works out for us to endear ourselves to them from the start. We have reached out to college championship sports teams and are going to recognize them before this game. So, if your team won a championship, start harassing your Athletic Director for more information about this game. Come out to Hadlock Field for some day baseball and pay tribute to your local “Hometown Heroes”. These are the men and women of your local Fire, EMS and Police Departments that help keep our cities and towns safe throughout the year. They will be honored on the field before the game. If you know someone who needs to be recognized in this, contact your local Fire, Police or Emergency Responder Department, as they already have the letters calling for nominees. Also, the first 1,000 fans through the park that day will also receive a Sea Dogs magnet schedule thanks to Paul G. White. The magnet schedule is clutch for people who can never refold the pocket schedules properly. Have you tried? It’s like putting shoes back into the shoe box. New for 2012, we are doing a special Faith & Family Day at Hadlock Field. I know, isn’t everyday family day here? Well, technically, yes, but we are working to make this day extra special. Brayton has been contacting churches and youth groups to join in a special a pre-game chat about how our players and coaches balance their busy travel schedules with their own personal faiths, family lives and goals, as their loved ones are usually thousands of miles away. If you have a church or a youth group interested, contact Brayton at bchase@seadogs.com. This is also our first Hoods Kids Club day of the season. The activity for the Kids Club members on this day is a pre-game parade around the warning track starting at 12:15pm. Click the Hood Kids Club link in this paragraph to sign up your kiddo if you’d like to participate in this and the other fun events throughout the season. Also, as with every Sunday game, kids 16 and under are welcome to run the bases after the game thanks to Prime Motor Group. Running the bases is obviously weather permitting, but we keep you posted throughout the game as to the status of the event. This is our special Military Monday kick off. Military Monday is a special ticket deal available to military members and their families for Monday games throughout the season sponsored by 106.3 The Bone. Military members, weather you are active, retired or the spouse of a deployed member, can print the coupon here: http://www.boneradio.com/. Show the coupon and your military ID at the box office to redeem your tickets to our special Monday Games. Additionally on this day I am happy to report that we have a motorcycle parade scheduled pre-game by the Maine Chapter of Rolling Thunder. Rolling Thunder is a wonderful organization dedicated to keeping the memory alive of the men and women who are prisoners of war or missing in action. This group will be at Hadlock Field in force on Monday, making a dramatic entrance onto the field via the centerfield entrance, riding around the warning track and leading the stadium in a moment of silence. I’m a professional civilian, who could be described “soft” or “wimpy”, and know nothing of the sacrifices of our men and women in uniform, so please join us on this special day and thank the people who allow us to continue our cushy existence. This day is known to most Americans as tax day, a day when we are reminded of the wonders of democracy. To commemorate this day that reminds us that only two things in life are guaranteed, Death and Taxes, we have partnered with Jones, Rich & Hutchins to give away a Tombstone to one lucky fan. Obviously you must enter at a special sign up location in the concourse because I refuse to draw a “lucky” fan for this, and you must be present to win. Yes, a Tombstone, why not? This homestand is always a blast because, well, baseball season is a blast. We hope to see you at any one of the games that we highlight throughout the year. If you have any questions about the promotions that we are doing, please feel free to reach out to me at lriley@seadogs.com. 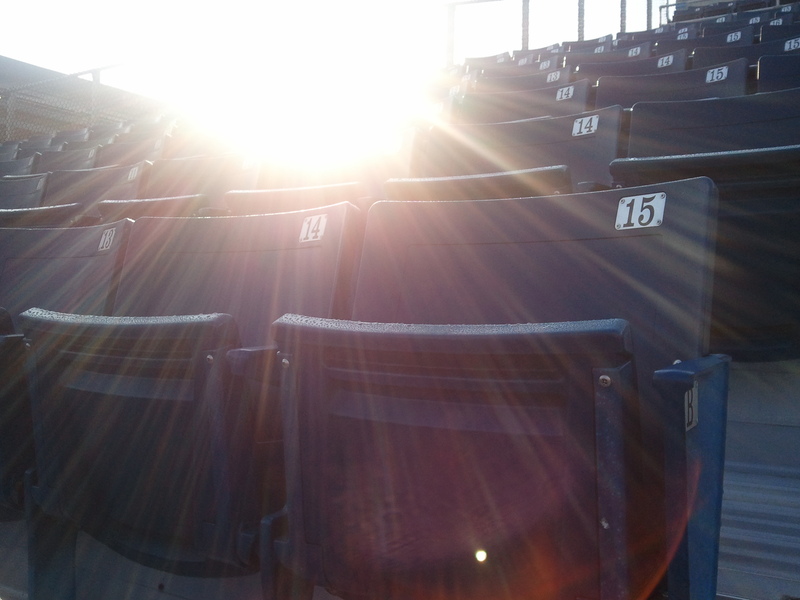 The first sun of spring rising over our seats. Thanks, Mark! And I will forgive you for the 60 seconds that you did not enjoy yourself here. Great pics, and I can’t wait to get to the ballparks this season! Too bad I never saw the sun in Portland, but had a great time anyway! Go Sea Dogs this season!! !